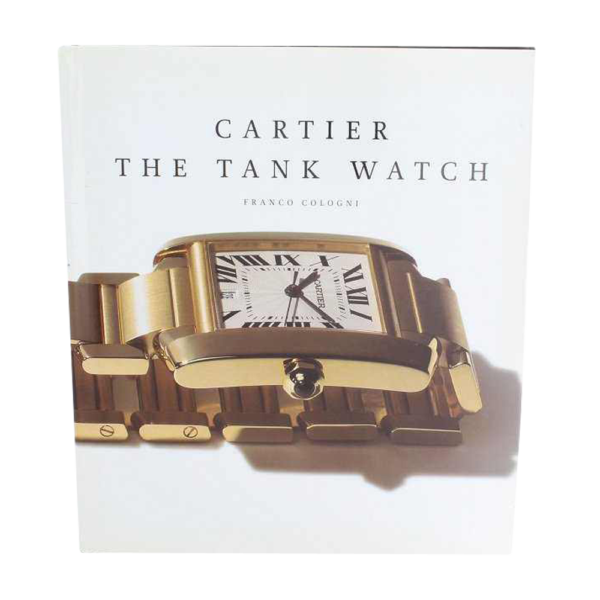 “””Cartier The Tank Watch”” book by Franco Cologni, published by Flammarion, 1998. Hardcover book. Among all the timepieces created during the 20th century, the Tank watch, designed by the master jeweler Louis Cartier has remained the most long-lived and the most coveted by glamorous people around the world. Inspired by the modernistic design of the Renault tank and given to General Pershing in 1918, it was the first elegant wristwatch destined for the modern man of action. Adapted also for women, the Tank has been a constantly evolving masterpiece of the jeweler`s art while remaining an object of practical design for an age of technological progress. This elegant volume traces the story of the celebrated Tank from its inception in 1917 throughout the century, weaving history and anecdote, and linking its many variations to the other great designs for watches and jewelry from Cartier`s long and distinguished production. An illustrated history in three parts covers the evolution of the design and tells the story of the famous people who wore them. This is followed by an extensively researched, comprehensive catalogue featuring more than 250 vintage models drawn from Cartier`s archives as well as numerous private collections around the world.